You’ve probably always been told that you have to plant an amaryllis (Hippeastrum) leaving the top third of the bulb exposed. Thus many gardeners are convinced that this is absolutely required, that the plant will rot if ever it were to be covered completely. However, wild amaryllis bulbs grow completely underground, like most bulbs. Why the difference? The idea that the bulb has to be planted with its neck exposed comes from the fact that the amaryllis is largely grown as an indoor bulb. The bulb is so large that, if you did bury it completely when you plant it in a standard pot, there would be no room for the roots. By planting the bulb with the top third of the bulb exposed, you’ll be leaving plenty of room for its roots to develop underneath. And indoors, with no predators out to eat any bulb part that is exposed, this unusual way of planting the bulb does no harm. 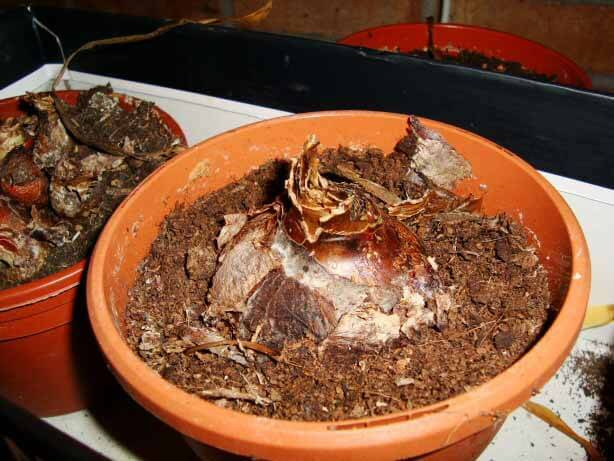 However, if ever you do plant your amaryllis bulb in an extra deep pot while leaving the neck exposed, you’ll discover it will actually pull itself underground over the next year or so, thanks to its contractile roots. If you live in a mild climate where you can plant amaryllis bulbs in the outdoor garden (zones 9 to 12), you’ll find they do much better when the bulb is completely buried. Plant it in a rich, well-drained soil, just barely covering the bulb. Depending on the cultivar, it may stay at that depth or “dig itself deeper” over time. Some gardeners even manage to grow amaryllis in zone 8 or 7b, but if so, plant the bulb more deeply, with up to 3 inches (8 cm) of soil covering it, and mulch it heavily in the autumn as well, as you’ll want to keep the bulb frost-free. 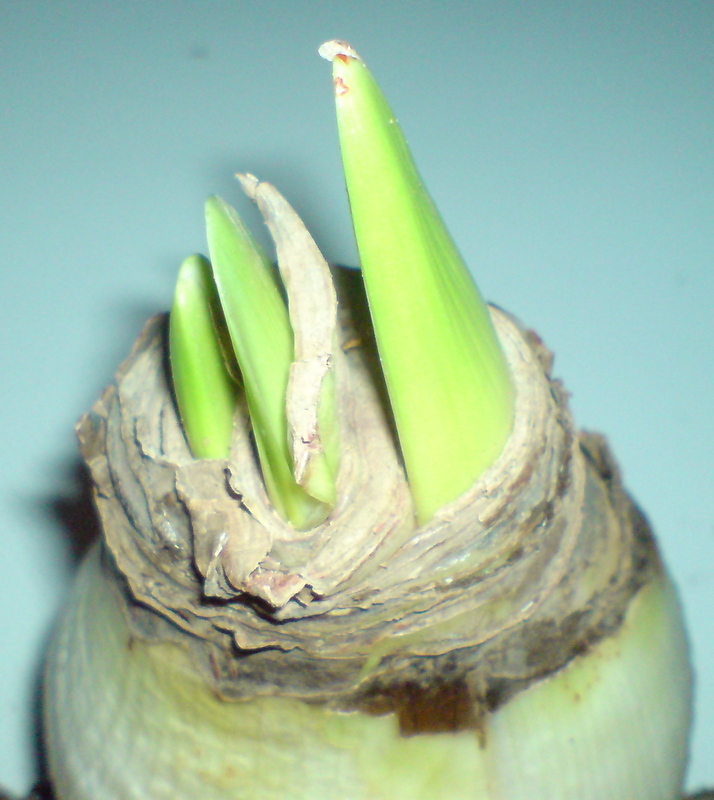 Amaryllis: the planting depth depends on root growth and cold protection. Who knew? Yes, it’s that time of year: head into any store, even a supermarket, and you’re likely to find displays of amaryllis bulbs (botanical name: Hippeastrum). This huge bulb produces trumpet-shaped flowers and is very easy to grow and flower… the first time, at any rate. 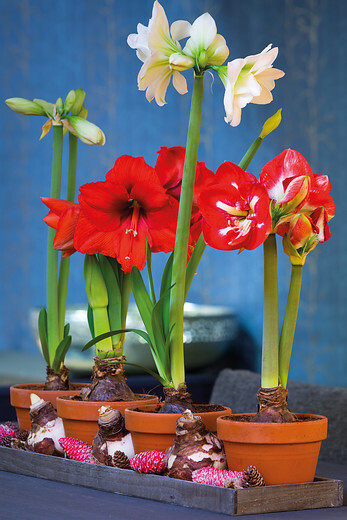 Since they take about three to eight weeks to bloom from the time you pot them up, if you want amaryllis flowers for Christmas, this is a good time to start. Amaryllis bulbs already contain the buds of the flowers to come when you buy them, so even black thumbs will have no trouble getting them to bloom. In fact, even if you don’t pot the bulb up and just leave it lying on a shelf somewhere, it will still bloom. How easy is that? Growing an amaryllis is also a great little project for introducing children to gardening. Even 5-year olds will be impressed by the speed at which the plant grows. 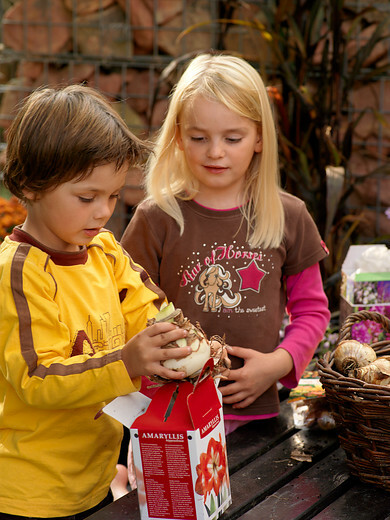 Amaryllis kits are practical, widely available, and great for teaching kids about gardening. 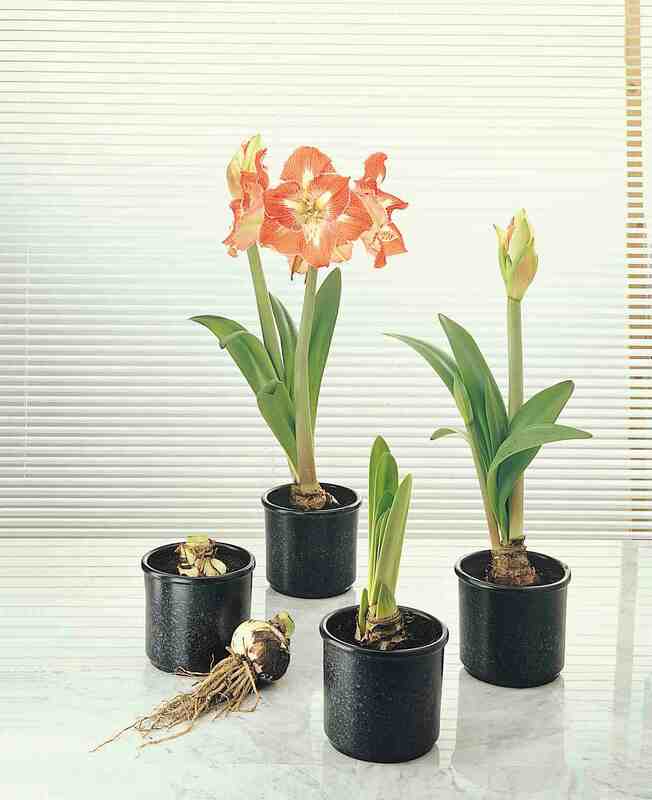 An amaryllis bulb is most often sold in a kit that includes a pot, potting soil and the bulb itself. And that does work, but… the bulbs sold in kits are usually lesser-quality bulbs that give fewer and smaller flowers compared to dry bulbs. Also, kits often include pots that are too small to adequately support the bulb, don’t have drainage holes (which makes watering tricky) or are so light the top-heavy plant tends to flop over. So even if you do purchase a kit (and they’re all you’re likely find in supermarkets, box stores, and other non-specialized venues), you’d do better to at least pot the bulb up in a more appropriate pot. More about that below. The best bulbs are kept for bulk sales. The best quality bulbs are kept for bulk sale – open displays of dry bulbs – for obvious reasons. Rather than dealing with a closed box where you can’t even see the bulb you’re buying, you actually get to hand pick your bulb… and would you pick a skinny, weak-looking, second-quality bulb over a huge, heavy, robust, top-quality one? In spite of its superior quality, a dry bulb will usually cost less than a kit, at least in most stores. Locally you aren’t likely to find dry bulbs anywhere but in nurseries and garden centers. 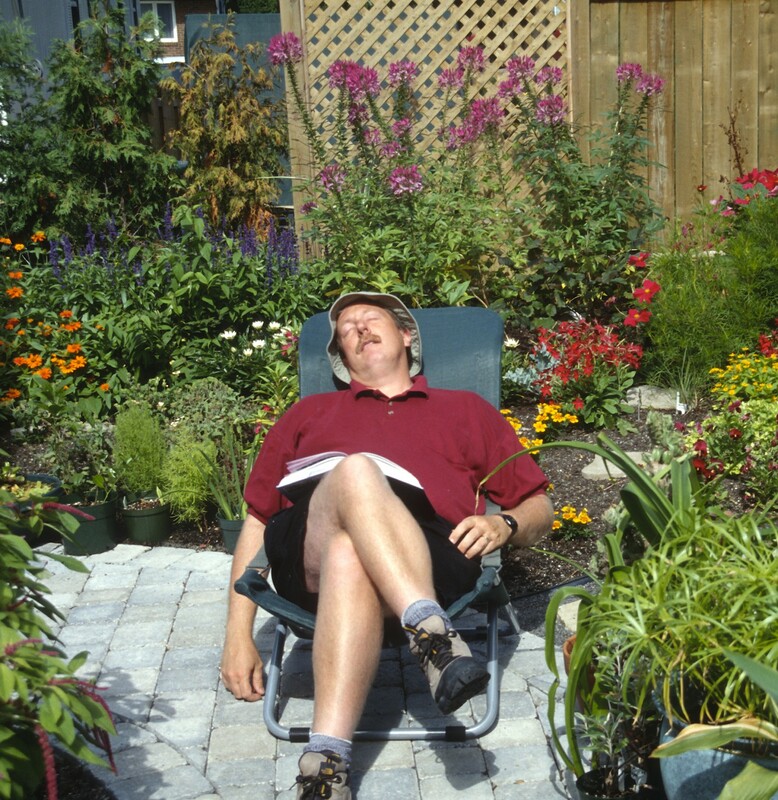 Mail-order nurseries will also ship them to your home if you order early enough. Choose the color and shape of the flower from the photo that accompanies the display: amaryllis flowers can be red, pink, salmon, white, yellow, green or bi- or tricolor, single or double, large or small. Look for a bulb with multiple flower buds showing. Of course, you can also buy an amaryllis that is already potted and in the process of flowering, but that will cost you more… and you’ll be paying top dollar for a plant whose flowering is perhaps already in decline. Two weeks after potting up, the flower stalks are ready shooting for the sky! Once you have a bulb on hand, look for an appropriate pot. 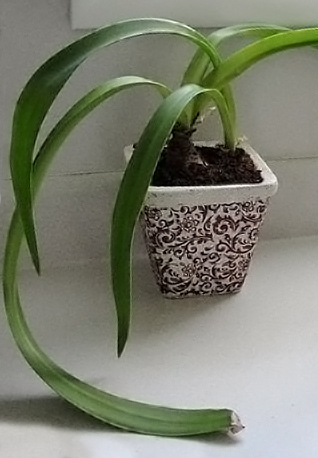 The belief that the amaryllis likes to be pot-bound is a myth. 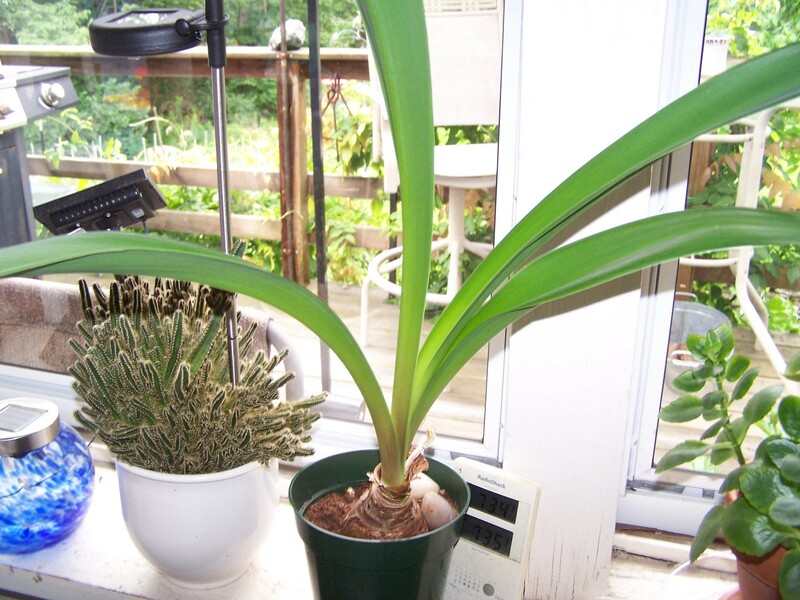 They have a substantial root system and it needs room to grow, choose a pot at least 2 to 3 inches larger than the bulb. It should also have one or more drainage holes. If it’s made of a heavier material, like clay, that will help hold the plant up. If not, don’t worry: you can insert a lighter pot into a heavy cache-pot later. Half fill the pot with houseplant potting mix (if you moisten it ahead of time, it will be easier to work with) and center the bulb on the mix, spreading its thick roots out somewhat. Now fill the pot with more mix to about 1 inch (2 cm) or so below the rim and press down firmly to settle the bulb in its pot. 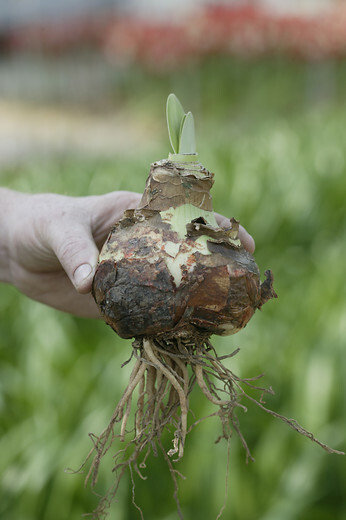 This will result in the bulb being only half-buried, which is great because that leaves more space in the potting mix for the bulb’s future root development. Place the pot on a saucer or in a heavier cache-pot and water lightly. You can also grow amaryllis without soil, in stones, gravel, or marbles, typically using a transparent container. If so, you’ll need a pot without a drainage hole so the pot’s bottom can act as a water reservoir, as the substrates mentioned hold no moisture. 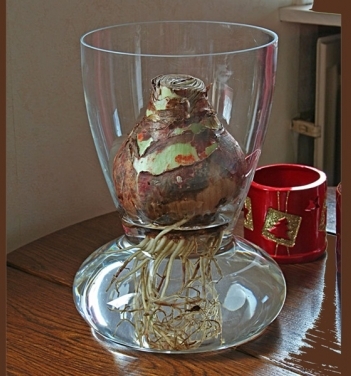 There are even special amaryllis vases designed to hold an amaryllis bulb above water using no stones at all. Be aware, though, that if you don’t use potting soil, this will weaken the bulb and it will only be good for the compost bin after it has bloomed. Finally, a quick note for our friends in the South: in zones 9 to 11, you can simply plant amaryllis bulbs in the garden, just barely covering the bulb, and they will then act like perennials, coming back year after year and sometimes even blooming several times a year. Water sparingly at first, then more abundantly as the flower stem grows. Let the soil guide you: water thoroughly when it is dry to the touch. Curiously, the long, narrow, strap-shaped leaves often don’t appear until the plant is in bloom or even after it has finished flowering. 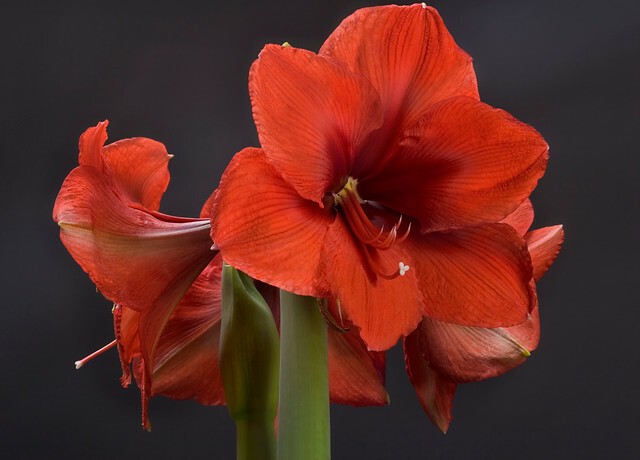 Amaryllis are perfectly adapted to average indoor temperatures of between 15 and 80˚F (18-27˚C) and can even tolerate temperatures down to 40˚C (5˚C) if necessary. The soil should be slightly moist at all times. A sunny location is ideal, since intense light will lead to a shorter, stronger flower stalk less likely to need staking. The bulb will start to flower in as little as three weeks, but more likely five to eight. If its flowering is coming along too quickly for your liking, you can delay it by placing the bulb in a cool spot. If you want to speed up its bloom, increase the temperature. While the plant is blooming, don’t hesitate to move it to a spot where it is more visible, even if gets less light for a while. A few weeks of lower light won’t hurt the plant too much. After plant stops blooming, though, move it back into the sunniest spot possible, at least if you want to see it bloom next year. You can cut the flower stalk after the blooms fade if it bothers you, but for the health of the plant, it’s better to leave it standing until it dies back on its own. Then you can remove it. That’s because, as long as it’s still green, it will carry on photosynthesis and thus helps feed the bulb. Note that it is possible that your amaryllis blooms again out of season, maybe later in the winter or spring or even summer. If so, just enjoy the repeat performance! Let me be brutally honest and say that, while getting an amaryllis to bloom the first time is almost a sure thing, the same can’t be said of future blooms. So if you just want to toss the bulb into the compost bin after it blooms and buy a new one, that’s perfectly all right. Still, most people can get their amaryllis to rebloom if they put a little effort into it. Your goal will be to try and get the bulb, which will have shrunk considerably in size after it blooms, to plump up again. To do so, you’ll need plenty of sun, regular feedings, and a modicum of other care. 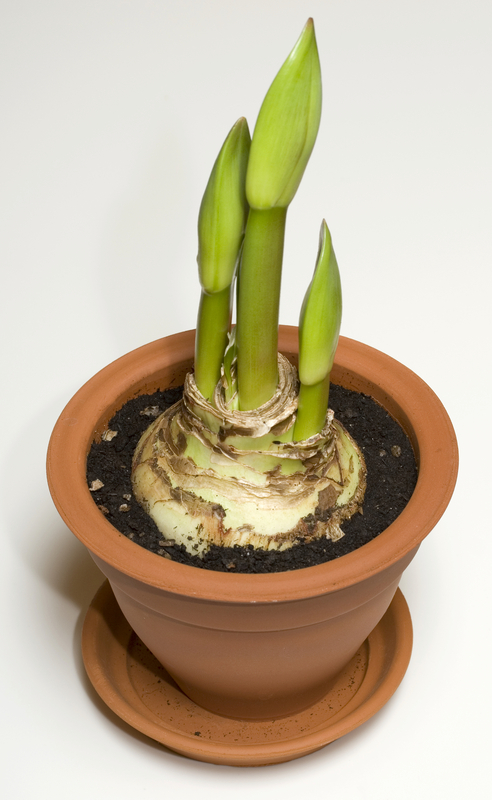 Here’s a link that shows what to do when your amaryllis stops blooming. 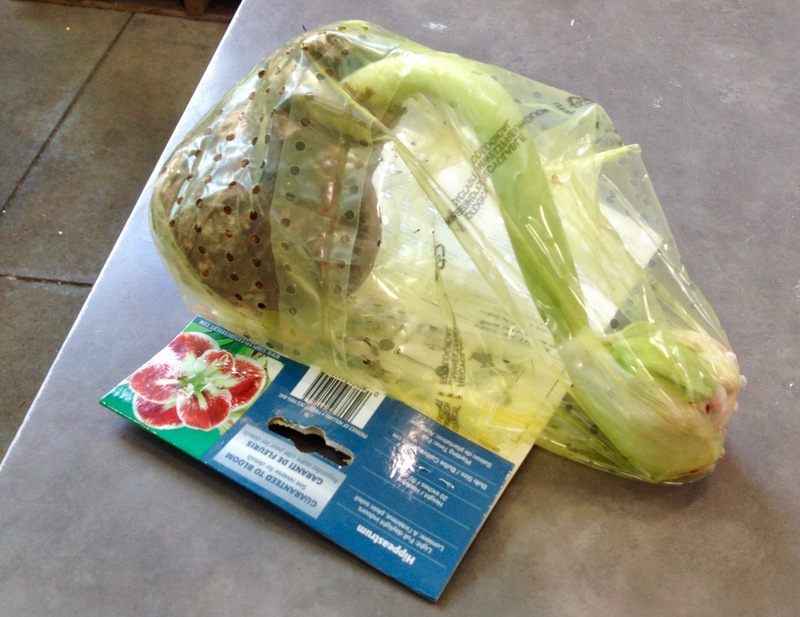 Should You Plant an Amaryllis Bulb with its Neck Exposed? You’e probably always been told that you have to plant an amaryllis (Hippeastrum) leaving the top third of the bulb exposed. Thus many gardeners are convinced that this is absolutely required, that the plant will rot if ever it were to be covered completely. However, wild amaryllis bulbs grow completely underground, like most bulbs. Why the difference? The idea that the bulb has to be planted with its neck exposed comes from the fact that the amaryllis is largely grown as an indoor bulb. The bulb is so large that, if you did bury it completely when you plant it in a standard pot, there would be no room for the roots. By planting the bulb with the top third of the bulb exposed, you’ll be leaving plenty of room for its roots to develop. And indoors, with no predators to find any bulb that is so exposed, this unusual way of planting the bulb doesn’t harm it. 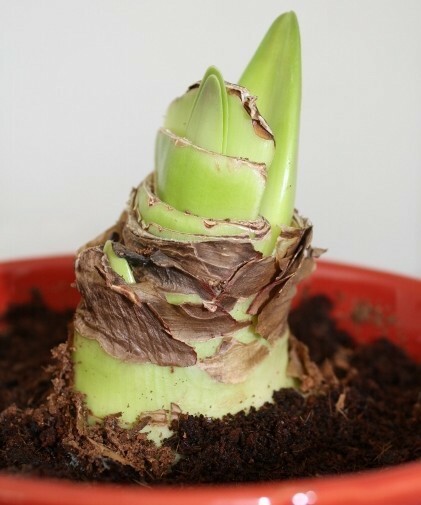 However, if ever you do plant your amaryllis bulb in an extra deep pot while leaving the neck exposed, you’ll discover it will actually pull itself underground over the next year or so, thanks to its contractile roots. If you live in a mild climate, you’ll find an amaryllis does much better when the bulb is planted completely underground. Plant it in a rich, well-drained soil, just barely covering the bulb (zones 9 to 12). Depending on the cultivar, it may stay at that depth or “dig itself deeper” over time. Some gardeners even manage to grow amaryllis in zone 8 ou 7b, but if so, plant the bulb more deeply, with up to 3 inches (15 cm) of soil covering it, and mulch it heavily in the autumn as well, as you’ll want to keep the bulb frost-free.